It's Labor Day, and that means it's autumn. Yes, I know that fall does not technically begin for another few weeks, but basically, this is it. May as well embrace it! And I do! I love fall--the leaves, the fashion, the crisp air. Fall weather is actually my favorite for running! It was last October that I became a runner and ran my first 5k to prove it. Then, I caught the bug and continued running through winter, before my love affair with running began to stall. I haven't been running as much as I'd have liked this summer. I found the heat too daunting to even venture out into. 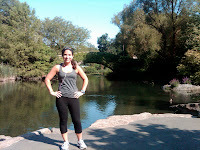 I did, however, log some miles on the treadmill, participate in a 5k run through Yankee Stadium, and enjoy a 5k Fun Run. 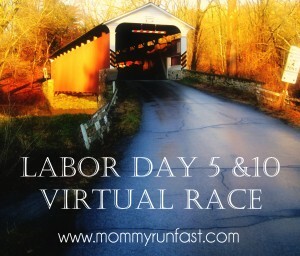 This weekend, I aimed to return to my former mileage by taking on 5 miles, motivated by the Labor Day 5 & 10 Virtual Race, hosted by MommyRunFast.com. I didn't wear the bib, but I did put on some Reebok gear, lace up my shoes, set my Garmin for 5 miles, put on my Run for Fun headband, and hit the road. It was my first time running through the streets of the city. Well, the first time I was intentionally running through them, rather than just rushing to make the train. Let me tell you: it was just as annoying as I thought it would be. I enjoy the open road, the fresh air, and seeing the sky when I run. These things do not happen on the sidewalks of New York. Instead, I weave through throngs of people and stop for traffic. Annoying. 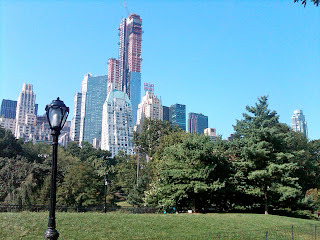 Soon, I did reach my true destination: Central Park. This part of the run was lovely, and so I enjoyed my miles spent roaming the paths. Fortunately, my Garmin would track my distance so I had no set path to follow. If I'm being honest, I often chose the ones that looked less hilly. 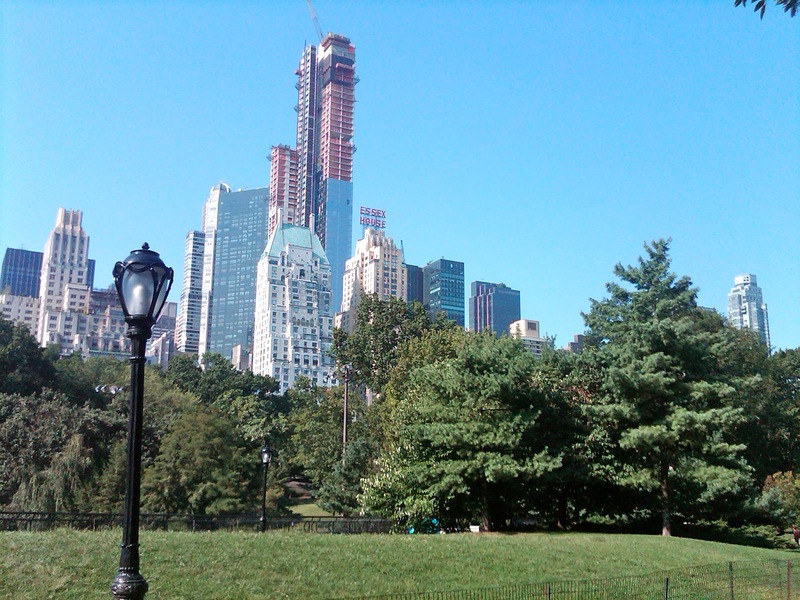 Central park has HILLS! Wow. It was definitely a struggle, having not run outside too often lately. My legs weren't having it, but I plowed on. Running around the water was my absolute favorite. What a beautiful scene! About halfway through my run I admit, I stopped to just enjoy the sun, water, ducks for a moment. I had to! So gorgeous; I didn't want to speed by. Not that I was speeding. I would run quickly and take some walking recoveries. The hills, the hot sun, the people milling about... it was a nice run but not my best for time. But that's okay; at least I did it! I finished the five miles in under an hour, which was my goal. With so many hills (for which I have not trained at all), I couldn't have asked for much more. 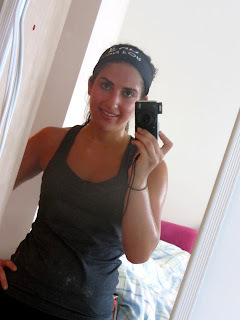 I was red and sweaty after, but felt great! It'd been a while since I had a serious run. I look forward to more! With this run, began my autumn. I want to start off the month on the right foot (ha, foot...), so a run began it. There are some big changes coming to my workouts, so I'll have to rework some of that this month. EAT: real, whole foods. After having a fairly lax July and August (and now feeling the unpleasant effects), I need a "reset" button to remind myself how great I feel when I follow paleo principles and avoid wheat. So, this month I'm doing a Whole 30 (via It Starts With Food) and using my Practical Paleo book for guidance and recipes. MOVE: effectively. With big schedule changes coming, my goal is to cut back gym time and work out twice per week. I don't want to overwhelm myself while I'm adjusting; I want to be realistic and focus on quality over quantity. I want my two or three workouts to be effective. I want them to be short and sweet, working my muscles to the max in the minimum time. SLEEP: at least seven hours nightly. Eight is better. Seven is reasonable. ENJOY: I'm not making this a "SMART" goal, because my September will be mostly about work, but in general I'd like to spend time with friends when possible (twice per week? ), sneak in some yoga (maybe to wake up? ), and taking some time to read a book for pleasure, scrapbook, or go wandering in the nice autumn weather. Wouldn't that be nice? How was your Labor Day weekend? How did you stay active? What are your goals for September, for the fall?